October 28th, 2011 – First frost. Brrrrr… we even had ice on the sidewalk. But, it is sunny! 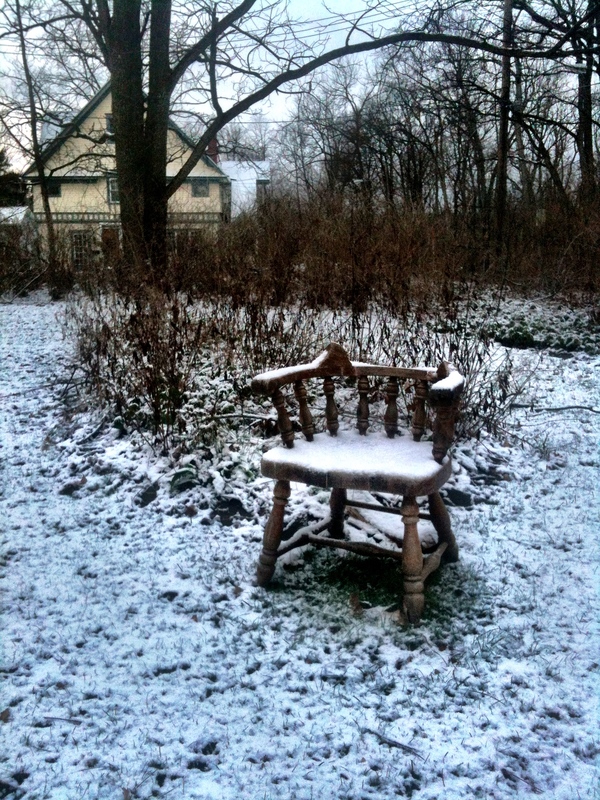 Day 1 – November 17th, 2011 – First snow of the season. It snowed long enough to dust the lawn. It looks more like a heavy frost, but it did fall from the sky. It isn’t enough to measure, but because it is white, and on the ground and fell from the sky, I will count it as the first official snow of the season. 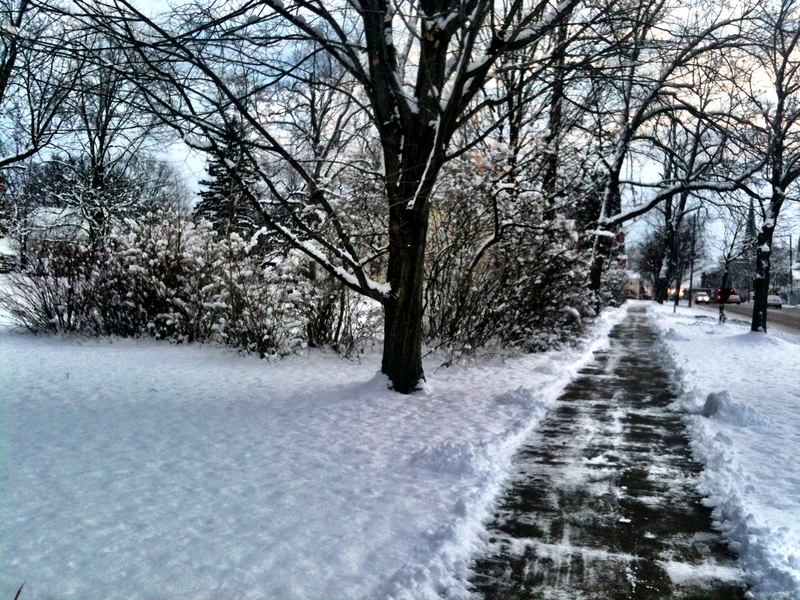 Day 2 – December 9th, 2011 – Okay, this was more like snow. It stuck around for a couple hours after, and then the sun came out. I managed to get a few photos. Day 3 – December 17th, 2011 – Another light dusting, and flurries all day long, but nothing really sticking to the streets or sidewalks. Day 4 – December 23rd, 2011 – I wouldn’t count this if I didn’t see it. Yeah, there was snow coming down, but nothing stuck. It was in the low 40s and there were big flakes falling, but they melted as they hit the ground. 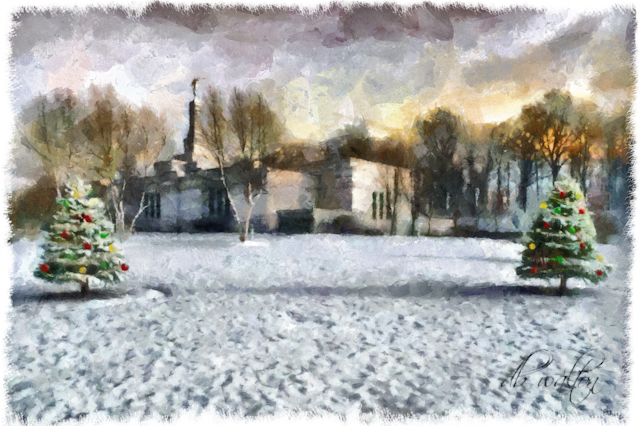 Day 5 – December 24th, 2011 – Work to a dusting. Now it looks like Christmas in Palmyra. There’s not enough for it to stay very long, but at least it is white outside. 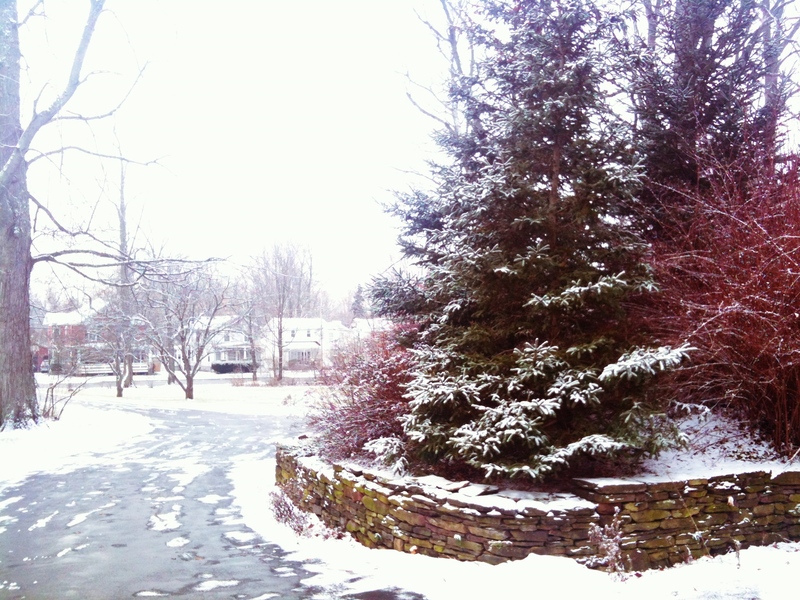 Day 6 – December 28th, 2011 – Woke to snow. It wasn’t sticking, but it was windy and damp. I drove in to Rochester and about the time I got there, it started sticking. Right now… about 1/4-1/2″. Again, not a lot of snow. 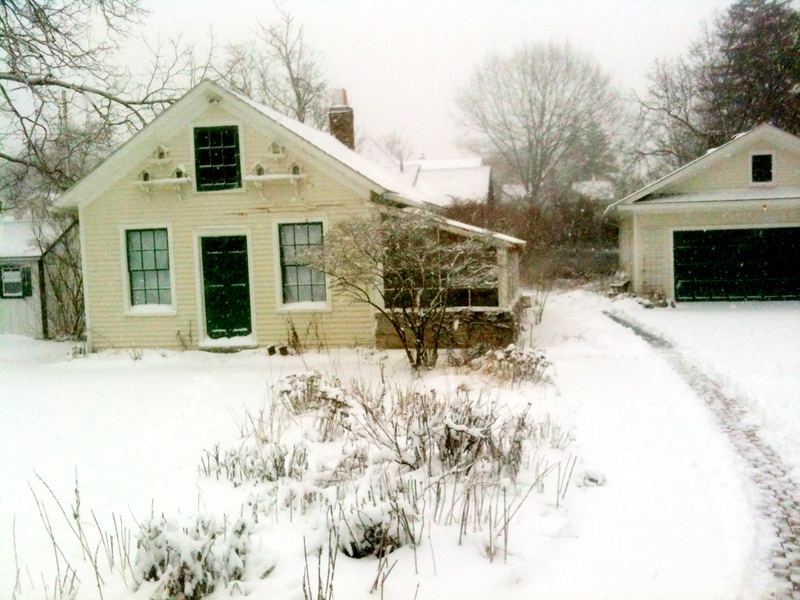 Day 7 – January 2nd, 2012 – Woke to snow again. This would be the first snow of 2012. The picture will show it isn’t much. It was 32F when I checked this morning. When I went to bed last night, it was raining. First snow of 2012. Day 7 this season. Day 8 – January 8th, 2012 – There was a little white on the ground when we left for church this morning. 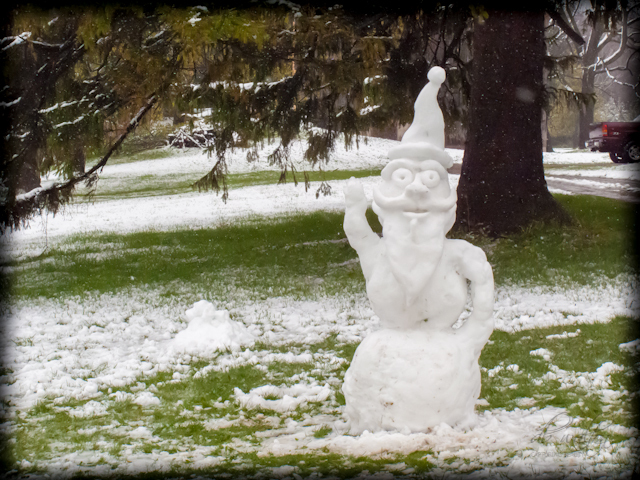 I’m going to call it a snow day, but really… that was snow? Day 9 – January 13th, 2012 – We got SNOW. It was really coming down when I got up and shoveled. By day’s end, we had about 2 to 2.5″ of snow. Day 10 – January 14th, 2012 – Another day of snow. It hasn’t been as heavy as yesterday. Perhaps a 1/2 inch. Day 11 – January 15th, 2012 – We had some snow over night, and then a few flurries during the day. The sun came out and melted some, but then when it went down, the temperatures really dropped and made things very icy. Day 12 – January 18th, 2012 – Got a very light dusting. Day 13 – January 20th, 2012 – There was about 1/4″ of snow on the driveway this morning. Not enough to even shovel. Day 14 – January 21st, 2012 – One inch of snow this morning. Because it was so cold, it coated everything on the ground and was enough to shovel. Got it and the driveway shoveled and cleared. Then the sun came out, and it all started to melt. Day 15 – January 24th, 2012 – Not much, but some tiny balls that looked like little foam balls like in a bean-bag chair. Day 16 – January 25th, 2012 – We got about 1/4″ last night. It was heavy enough and cold enough that it stuck on the driveway. So, I shoveled it. Day 17 – January 30th, 2012 – I came out of the house today to find about 4″ of new snow. That’s a LOT for a single night in this village. 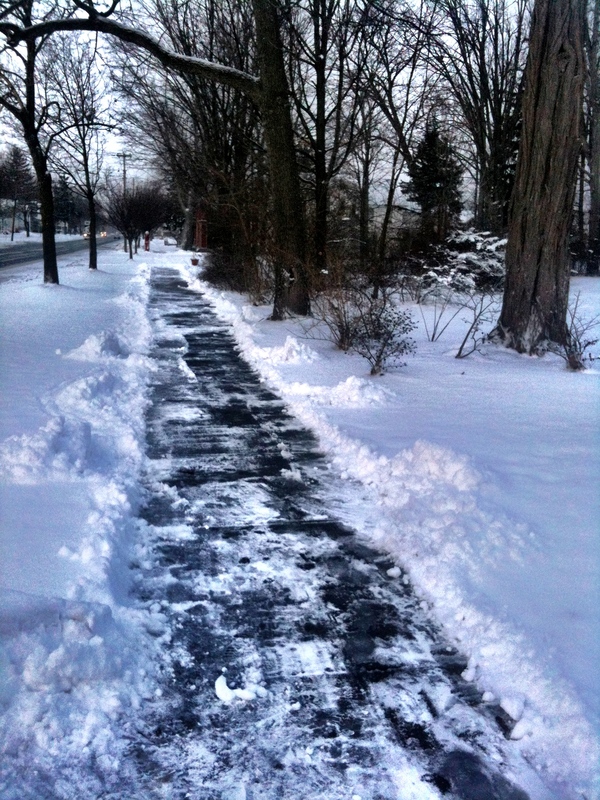 So, I got the ManPlow and began pushing it off the driveway and sidewalk. 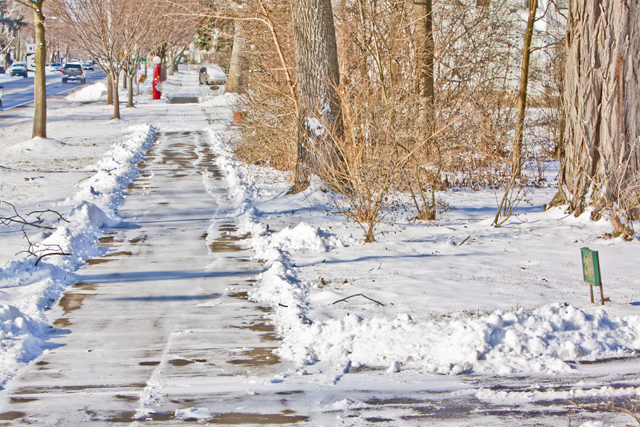 (Last year, the village began requiring property owners to shovel the village sidewalks. When 70% of our property tax goes to welfare, I really don’t think this change saved a lot of tax dollars.) By end of day, the snow was rapidly melting and slushy. Came evening, we got another very light dusting of snow. January 31st, 2012 – We were surprised tonight to walk out of the temple into 50-degree weather. It felt balmy for this time of year. Day 18 – February 11th, 2012 – We got a good 2″ of snow this morning. I managed to shovel the driveway and the village sidewalks. Day 19 – February 12th, 2012 – 7″ over night and another 2″ during the day. That’s 9″ today. That’s a BIG storm for this little village. February 13th, 2012 – I expected more snow this morning, but looks like the day is going to be sunny and melt some of the weekend’s snow. Day 20 – February 17th – It started to snow tonight. Right now it looks pretty outside. The question is, will it be here in the morning? 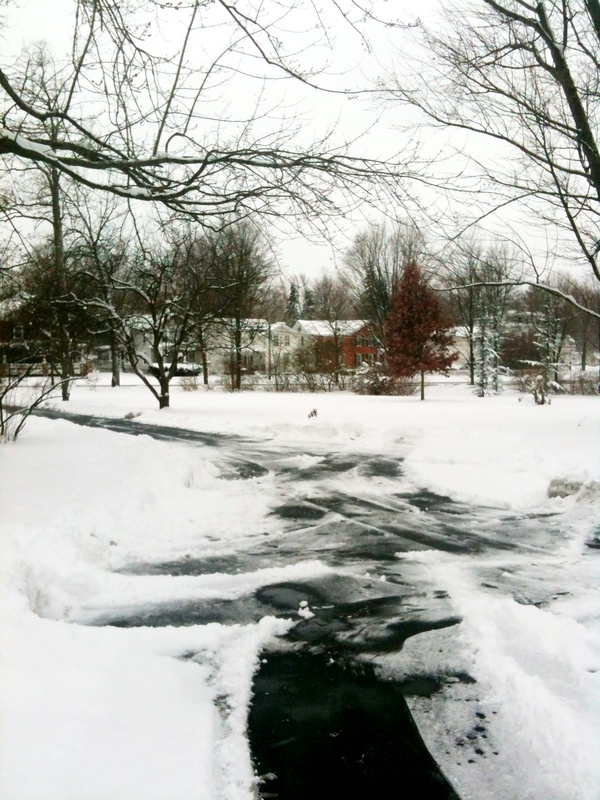 Day 21 – February 18th, 2012 – It’s snowing and so I went to shovel the driveway. But, under that snow is a sheet of ice like I’ve never seen before. It is like the driveway is made of black glass. I’m lucky I didn’t fall and bust some bones. Day 22 – February 23rd, 2012 – Another icy morning, but we also got snow. My forensic analysis of the layers on the driveway tells me it was raining, turned to sleet and finally snow. This made for a very slippery driveway. It also made for a very beautiful looking yard as the sun came up. 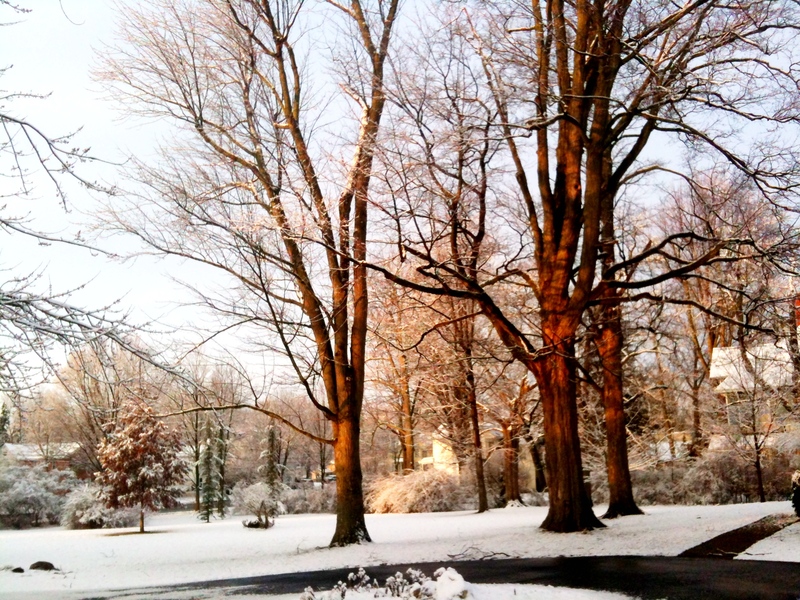 The photo below isn’t shot into the sun, but it showing how the orange glow brightened up the snowy scene. Day 23 – February 24th, 2012 – I came outside to snow this morning. There was about a 0.5″ blanket on the ground. Not enough snow to cover the grass, but there was quite a bit falling. The day’s just starting. Day 24 – February 29th, 2012 – Strange weather today. Nice when I left the house, and snowing around 10am. Then, when I left Rochester, it was raining. But, when I got home, it was clear, but there was snow on the grass. Day 25 – March 5th, 2012 – We had a blanket of white today. There was just barely enough to cover the ground. Day 26 – March 30th, 2012 – Just when you think you won’t see snow again until late next fall, it snows. It snowed for several hours. We have flowers blooming and snow coming down. Day 27 – April 23rd, 2012 – I had already given up on snow, so today really threw me for a loop. We got a blanket of wet, soggy, snow that lasted most of the day. I enjoy your play by play of the weather. I do love snow but hate the ice, like you said ,one could break something on it! and or go slowly sailing through a stop sign, bang crash,ouch!